OK, so Natick in this cycle has been a good pre-cursor of what is to come for other towns. Let's take a look at the price action to see what we can see. UH. Wait a minute. The prices paid in the last six months are much - much - higher than the prices being asked for by the homes on the market. That is not supposed to happen when things are good. Hmmm. Let's take a look at the detail chart. Anything stand out to you? Look at the decline in transactions. There were 300 transactions over a six month period in 2013. That was the really crazy market in Natick. But that number has been rotating downward, and is now under 200 - a 30% drop. That is a big drop. And more fuel to the fire: The homes on the market have been sitting around, even though they are priced at a discount to the market. The average market time is 112 days, and that's at the top end of this number that we've seen since 2012. So let's speculate. There aren't any properties on the market - about the same as we've seen for a year or so. So sellers are finding buyers - but there are a lot fewer sellers. The market is still good in Natick, but the lower prices on existing inventory means that a lot of homes aren't finding buyers who are chasing prices. It looks like pricing is getting more rational in Natick. At 313 dollars a square foot, Natick is very expensive to many of its neighbors - and buyers are noticing, and being more careful. What should potential home buyers do in Natick ? Well, be careful! This kinda looks like a market top. If the inventory builds this spring - and the buyers don't snap it up - prices aren't going anywhere. That will be very good for buyers! Watch the transaction volume closely going forward. It's not deal central, but it's very interesting right now. Very interesting. Sign me up for Automated E-mail Alerts of New Listings in Natick! Is this an old report? Get me an up-to date one! What should future home sellers do in Natick ? Um, don't assume your home will fly off the market at these valuations. If your home needs work, fix it before selling. Buyers are driving hard bargains for properties that need work. There are 32 homes actively listed as For Sale for Home Buyers. In Natick there have been 172 houses sold in the last 6 months, and 88 homes sold in the last 3 months. The Average number of Days on Market was 29 days for recently SOLD homes In Natick. 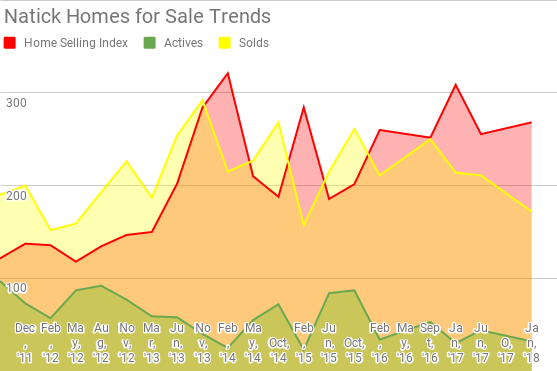 Homes for sale have been sitting for an average of 112 days homes For Sale (currently for sale). Natick , MA, has 1 properties advertised as lender owned or foreclosure (typically foreclosure) . There are 0 properties advertised as a short-sale is going to be needed by the lender. All raw data are for Single Family Houses and based on data in MLS. Matt’s HSI is proprietary*, and is designed to offer town-by-town information, instead of large scale trends. *That means you won’t find it anywhere else. Take that, Case-Schilling!. Want to know more about Me? Check out my reviews and then contact me! When #buying #homes, should I drop #contingencies in my #offer? Want to be a Landlord? Best Practices to get started.